In short, you paid full price for a 1080GTX and now the Ti is almost the same price. So what? If you're so concerned about money that you get upset that your product devalued by $100 over a year, you probably shouldn't be buying it in the first place. Some people just don't seem to understand, that Titan cards are targeting people who want the best at the time of release(7 months Early), and for those people price Is Irrelevant since they make that spent money back the next day anyways. The Ti might be slightly faster out of the box due to a better cooler and higher memory frequency, but I wonder how It would perform under water. Titan's are already shooting upwards of 11K+ GPU Score under water In TimeSpy. Only time will tell who's faster. Im far from concerned, obviously. i just wonder why people have a hatred of hardware that supersedes their own. When watercooled and clocked those cards lasted well. Well I mean it's changed over time..
Tesla's are 5x the cost for not 5x the performance. It's why Nvidia started removing features from the Titan line and adding features like NVLink to the Tesla line - to differentiate the two. Up until Pascal, the Titan's were basically identical to the Tesla in terms of hardware performance in deep learning except they cost way less. The Titan's then were more of a blend between gaming/workstation (FP64). With Maxwell it started shifting towards a blend of gaming/deep learning. But they were still 1/5th of the price for nearly identical performance - just less features. But now with the giant boom in DL, Nvidia changed it up.. made the Titan X (P) a good inference card, as it retains the accelerated INT8 performance from GP100.. but it lacks the packed math (double FP16) for training. Regardless, it's still 1/10th the price of P100 MX2 for half the flops performance in training (I'm sure memory bandwidth and NVLink make that half bit fuzzy) but the point remains that it's significantly more cost effective for small/midsized companies. Doesn't the 1080Ti get the int8 also? Man, there's people with a LOT of money. If they want to game, they'll buy a titan, why not? And Nvidia charging what they're charging is because they run a business and as long as those titans sell, they'll keep charging that. I don't say that people with money should do whatever they want with that. I was just critical of IT departments getting Titans, when Titans offer zero over the Ti models while costing 2x, all of that for a six month wait. And before anyone says "it's a race", on the Titan/Ti level, it really isn't. Any company for whom deep learning and the rest is a "race", won't even bother with Titans, it will go directly for Tesla cards. Professionally, they are just plain bad choice. Personally, for my rig (and not my company), this is my parts list if I never had to consider money. Yes, looks like a beast of a card, and in my humble opinion, not putting this thing under water is waste (also, 1080p gaming). IT departments have to meet work dead lines, they won't postpone their work and wait 6 months for a better card. The Titan Is an excellent choice for smb businesses that can't afford the Tesla (More Options Is Better). Trying the voltage tweak for afterburner. It won't let me save voer the original file. I've made the whole folder completely permissioned and the file too. Still says I have no permission so save. edit: got it so save. didnt do anything. Dream card for 4K and 1440p/1600p ultrawide users, will def get this card in my new setup! Didnt you had the 980ti, what happened? It has no real hardware differences from their "GTX" line, for getting more compute capability you actually need a Tesla card. They just offer the "Titan" models earlier at a huge margin for them, to effectively fund the rest of their line. The delay between the Titan and the immensely more cost effective "Ti" models only serve as an excuse for over-spending IT departments. Whoever really cares about HPC will go for Tesla anyways, so Titans seem more and more like a bad expense for people who can't wait for six months. Nvidia ia a nasty company when it comes to marketing, they have over the years figured out nasty ways to get us to pay up for the products. Like some (or many) years ago ti was the beast when it was gaming, then they got the chip that performed much better than they tough. Sell mid end card as high, sell ti as high end while titan that was ti before gets sold for a small fortune. Even tho i have a gtx 1080 and its a great card even tho it laks the punch for4k, but i dont like to buy from company's that follow this business model and fool their costumers.. I know a company need to emake money, but some have to few limits to how far they are willing to go to make the most as possible. Nvidia have shown us they are willing to go quite a distance to make you and me pay the most. Thats why i hope i can get hold of a gpu killing it in 4k, and not beeing nvidia. But if i found a cheap 1080ti, i would buy it. Your post had really no structure, and by that, i can't realistically understand what you are saying. Are you saying that because there are ti cards and titan cards that are more expensive the the normal xx80 cards that somehow nvidia is a horrible company? So you would rather it just be the xx80 cards? The ti and titan cards are not what use to be the xx80 cards, the xx80 cards are still what they always have been. In regards to cost, though, you may actually want to look up the history of graphics cards costs. This doesn't include titan, as i previously stated, thats a new line of cards that people seem to be getting confused about. You seem to be one of those very confused people. 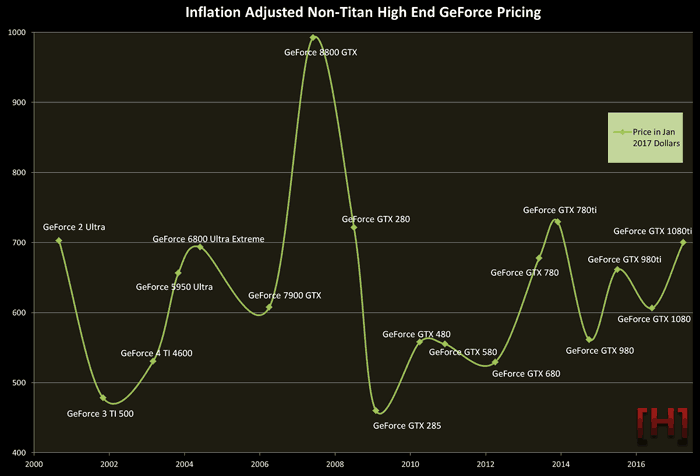 And as you can see, graphics cards costs have pretty much been the same throughout the last 17 years, excluding the 8800 GTX, which was exceedingly expensive. With a mindset like yours, you make it impossible for companies to even want to try and make something even more high end then they previously did. AKA if nvidia never came out with the titan cards, everyone with your mindset would be completely fine with the current generations of the xx80 series, and oblivious to the fact that nvidia could have given you more, all because you don't want "even more high end", you want to feel good about yourself when you buy a $500 card and tell everyone "I have the best card out there! ", but now can't, because there's even more high end cards out there, at a price you are unwilling to pay. Mindsets like yours stunt technology development. Also, why the pointless necro? prices are lil ridiculous, even if it "adjust" for the current dollar what they ask for cards is hard shallow for some if any thing chart show prices go up and down each gen sometimes lil some times alot, amd on the other end is more lay back with there prices in comparison. it all in the eye of beholder., my uncles refuses to play more then 100$ for gpu I refuse to pay more then 300$ resonable prices cards with great performance, dont really go together anymore. Why is it that inflation is only ever accounted for when someone wants to prove how this or that is acceptable or cheap? Manufacturers have been known to sell things for 200-300% more if not more then what it actual cost them to make things. What is cheap and acceptable or for that mater worth the price tag come down the individuals. GPUs should cost more then CPUs, they have a ton more material. A number does not matter, the value it is at is what matters. So why would inflation not be part of a conversation? If you don't include inflation to compare the past to the present, then none of it matters. Inflation/value is everything, a number is pure and simple, nothing. Materials are not everything. R&D is a massive part of costs, but it's hard to quantify how much R&D "costs" to an individual item. If a device costs $300 in parts, and they only expect to sell 1 million of those devices, and R&D + general labor(customer service, general employees not part of R&D, CEOs etc.) meant they would break even if they charged $300 over parts, at 1 million devices, they would break even, then charging another 100-200 would not be unreasonable. Heck, if they charge $800 for the device, "technically" making $500 over parts costs, but only sell 500k units, they would lose that money. But point being is simple. Costs to produce a product is not everything. R&D, Customer support, utility bills, general employees, management, resellers cut, shipping, packaging, device technical support (drivers and etc. team), rent/building costs, etc. etc. etc. All of this stuff goes into what determines what a business want, return wise, to make an ACTUAL profit. I mean heck, if you only take into consideration costs of the materials, digital games are almost %100 profit at that point. Whats hard to understand, nvidia overprice the products. Titan showed up in kepler (?) 680? Chip performed very good compared to previous chip. They sold the midend chip for high end price, with titan for allot more. Ti shows up øater on. They have somewhat followed this lineup since. Im saying since they can, they sell mid end for high end prices. Current state of the marked considering amd does not have anything to compete they can do this. You also have 2 titan card now, pre Ti titan and the ver. that came now. You should think titan was the full chip. But not in this case. Its a bit strange. You know Kepler had three Titan cards. Either buy or do not.